The JOOLA Rally TL 300 Table is a recreational table tennis table product that is designed to help users improve their skills, and break into the table tennis industry on a more competitive level. One of the first things you will notice about the JOOLA Rally TL 300 table tennis table is the high standard to which it has been produced. The charcoal-colored surface board looks nothing short of professional. The dark color design keeps the table looking fresh, and it contrasts with the ball nicely. The color definitely helps maintain the professional look of the product. The solid white markings again add an air of professionalism to the table, allowing for accurate game-play. One of the biggest advantages of this product is the overall design. Not only does it look good, but it has also been designed with the thought of being time and space convenient. The table came in two parts, in the box upon delivery. It is very easy to set up, taking no longer than around 30 minutes to put together and the instruction manual is short but helpful. Although the overall weight is heavy, so it recommends a two-person assemble. Furthermore, the table is particularly easy to fold up and move, so it is able to be stored out of the way when not in use. By simply hooking four latches, one on each leg, plus one on each half, the table is folded. The added benefit of having wheels on the legs allows for easy movement of the table if you prefer for it to be kept elsewhere when not in use. Surprisingly, despite its weight, the wheels allow the table to move around with ease. Hours of fun can be had on this ping pong table, made even better by the sturdiness of the product. After playing a few games on it, there is an obvious realization that the table is solid and durable. Adults and children can all enjoy the fun intended because, unlike cheaper alternatives on the market, you are not going to have to worry about breakage or damages from regular play time. So, whether you are an amateur or are just purchasing one for family fun, I guaranteed you will get impressed. It is worth noting that, if you are at a professional level already, this table is a recreational product, and whilst perfect for gaining experience, it is intended for people looking to break into the competitive scene. It is hard to fault this product based on overall satisfaction, and the only real negatives about the table come from the extra accessories supplied. Although a nice touch, the ball holders could do with being more solid, in order to allow for more balls to be held and kept in place. The only other problem I noticed was the magnetic scorers, although again an added extra, they are quite flimsy and don’t attract well to the counter. One bump to the table will allow them to easily fall off. 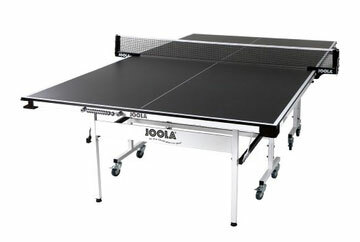 Overall the JOOLA Rally TL 300 Table Tennis Table guarantees customer satisfaction. It is quite an option other than the Joola Nova Tour DX Outdoor Table Tennis Table. The strong design and sleek look of the product allows any buyer an abundance of game time. There is not a better product for family fun, or for people looking to try their hand in the competitive market.